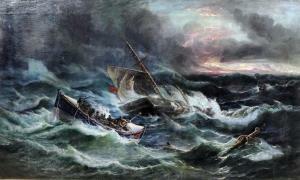 Find artworks, auction results, sale prices and pictures of Charles Robert Ricketts at auctions worldwide. Charles Robert Ricketts (fl. 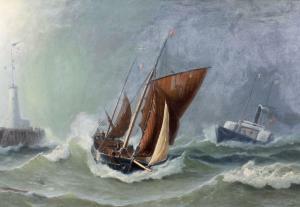 1868-1879), A stormy coastal scene, with French steam tug approaching a French fishing boat, both flying the tricouleur, oil on canvas laid down onto plyboard, signed to a piece of driftwood lower left, 23 x 34, (58.5cm x 86cm), in flower- and shell-decorated giltwood and gesso frame. Has been cleaned - some layers of paint lost. Evidence of some creasing/cracking to canvas which has been mitigated by laying onto plyboard in recent years.